Bob has recently published a guided textbook for art educators, teachers, parents or anyone interested in line, form and design fundamentals. 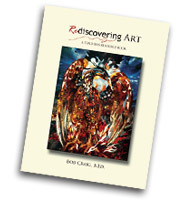 It can be previewed at Innercircle Publishing and is also available at Amazon.com, Barnes & Noble and Books-a-Million. I stumbled upon the Workhouse Arts Center the 11th of May and was drawn to the inaotnvive use of a prison. I love unique things and as I was looking at the various pieces of art, I was beside myself when I saw your pieces. I am visiting until the 27th and will be back Saturday for the Meet the Artist. Your art feels so right and I can see it being a perfect fit for my house in Arizona. I have been looking for something for some time and now I know I found it. I am not sure I can purchase now but I am definitely putting you on my to get list. I love it all but Moonlight is my favorite.